Happiness is a glossy, cherry red, heart-shaped strawberry. 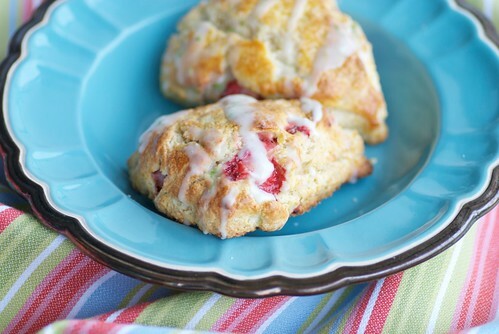 Elation is a Fresh Strawberry and Lime Cream Scone with Lime Glaze. If you've never paired strawberries and lime, then get ready for a delicious surprise. The tangy lime enhances the strawberries' sweetness and makes the glaze a mouth-tingling treat! Looking for more strawberry recipes? Then check out my Strawberries 101 post. You'll find several sweet and savory strawberry recipes as well as everything you need to know about selecting, storing, and eating strawberries. Awesome combo! Those scones are to die for! Perfect -- we're just into the height of strawberry season here in RI! It is absolutely the most beautifull strawberry I'v ever seen! These sound like the most delicious and intriguing scones I have ever heard of. Would love to try these! That is one humongous strawberry. If the scones are as delicious as the photo, I'd like two please. We don't have strawberries that look like that in Vermont. But that won't stop me from trying those scones. They sound great! I love it when I see recipes with limes - they're so abundant here, Susan! And the strawberries are at their peak, too - lovely recipe! 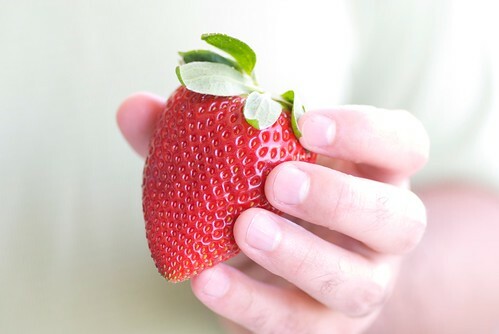 That is such a beautiful picture of a strawberry! And yum scones - great to start the day (with coffee of course). Strawberries are in season and I am definitely doing my best to consume as many and in as many different ways as possible before they are gone. Scones are my weakness. Ok, one of many, but I love scones. Lime with strawberries sounds great too. I'm always looking for ways to use my favorite strawberries. Your scones are amazing looking, and so is that huge strawberrie! lydia-June in RI is so lovely. margot-We are lucky (and a little spoiled). jessica-You just made my day! anonymous-Good! I'm glad to hear it! patricia-Do you know I always think of you when I bake with limes? Seriously! lisa-The strawberries and lime really play off of each other well. lynda-Well, I hope you try this recipe because it's really a winner. I promise! And to think, all this time I thought happiness was a warm gun. Someone should tell the Beatles. These look delicious. I've been loving fresh fruit-filled treats lately. I love strawberries and I love scones so these look great to me. I have made scones with dried strawberries before, but never fresh and I love the idea of experimenting with fresh ones. I think the lime must be really good in them. Yum - strawberries and lime! When I made gelato the other day and squeezed a bit of lemon in the mix, it really brightened the flavors. I bet lime would be such a delicious surprise! I love it with other berries. These look delicious. Truly delightful scones Susan. Refreshing & perfect! They do spell happiness! Love the combination in your your scones Susan. This sounds like a great combo. They look delicious too! I feel pretty good now. Thanks for the the uplifting recipe and photos. I miss your lovely blog. So happy to rediscover it! I have never seen such a huge, perfect strawberry! I think I may have to invent a strawberry lime ice pop after seeing this delicious looking recipe. That is one big strawberry! I am very happy! I've spent the past three weeks picking strawberries on Saturday. They are beautifully red throughout, and so sweet! And, I just made a strawberry rhubarb cobbler that was perfection! Oh man! Scones are one of my absolute favorite things ever. Especially strawberry scones. But I've never thought to add lime to the flavor combo. Fabulous idea! joanne-Who doesn't love fresh fruit-filled treats? sdoc-And I've never tried baking w dried berries. We should swap! tastyeatsathome-I'm sure it would! Tangy and refreshing! anonymous-You're right. Size doesn't equate with sweetness. Sweetness has to do more with the type of strawberry and allowing it to vine-ripen. For the record, that strawberry was big and sweet! ramblingtart-How sweet of your mom. Now you'll have to bake her some! redmenace-That's nice of you to say. Thanks! TW-Strawberry picking is one of life's simplest yet most satisfying pleasures, isn't it? I bet that cobbler was amazing, esp. with a scoop of vanilla ice cream? sues-Give it a try! You'll love it! lyb-That's what I like to hear! Baked these and would like to post your recipe linking back to you. Is that possible? I just made these and they were AMAZING! Everyone I served them to wanted the receipe. They tasted light and fresh and were far from ordinary. Thanks Food Bogga!